Vinayaka Chaturthi or Ganesha Chaturthi, the birthday of the murthy of Muladhara – Lord Ganesha, this year falls on September 1st. Lord Ganesha removes fear and He was the only deity who dared even to fight with Lord Shiva. Muladhara represents both the extremes of the fear factor. When it is slow, the person feels highly insecure while when it is in high speesd the person is prone to take extreme risks. Lord Ganesha balances this Chakra. He stimulates intelligence, enhances your problem solving skills, stabilizes your emotions, removes obstacles and hand holds you to success. 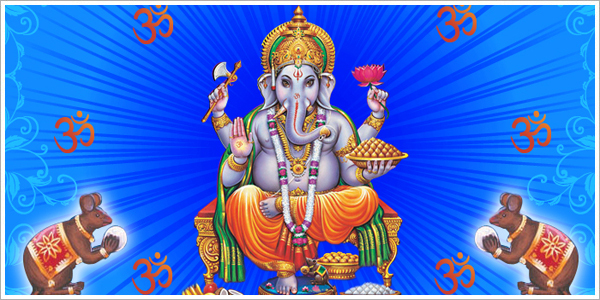 Muladhara represents the element Earth hence worshipping Clay Ganesha helps you to access the blessings of Lord Ganesha and to remove your Karma. The sense organ that Muladhara represents is nose and the sense is smell. With His trunk he urges us to probe into things. They are special features of Ganesha, the only deity with an elephant head. Gain the blessings of Lord Ganesha with Clay Ganesha, which is a very special offering to make during Ganesha’s birthday. Clay Ganesha can absorb your karma just like coconuts, and when dissolved in the ocean will dissolve your karma as well. Lord Ganesha’s head symbolizes the soul, which is the eventual and supreme reality of human existence. His body signifies Maya and His trunk represents “OM”. His ears can hear all our prayers and the snake that runs around his waist, represents energy in all forms. Ganesha uses a mouse (represents anger, pride, selfishness etc) to ride, which indicates us to have a control on all these evil passions. And finally the “laddoo” that he holds in his trunk, signifies that one must discover the sweetness of the soul. The cosmic belly of Ganesha contains the seven worlds above and the seven worlds below with their seven oceans held together by the cosmic energy kundalini symbolized as a huge snake which Ganesha ties around him. Kundalini represents the unification of the feminine Shakthi energy and the masculine Siva consciousness through the Ida and Pingala Nadis, which when aroused gets united and passes through the Sushumna Nadi which marks the enlightenment. The Kridakhanda of the Ganesha Puranas narrates the stories of four incarnation of Ganesha in the four different Yugas. In the krita yuga, He was born to Sage Kashyap and his wife Aditi. He had ten arms and had a red complexion and mounted an elephant or a lion. He was called by name Mahotkata Vinayaka. In that incarnation, he killed the demon brothers Narantaka and Devantaka as well as another demon Dhumraksha. In the Treta Yuga, He was referred to as Mayureshwara, since he mounted a mayur or peacock. He had six arms and His complexion was white. He was born to the Divine couple Lord Shiva and Parvati and slained a demon called Sindhurasura who was named so due to his red complexion. The purana also says that at the end of this incarnation he gives to His peacock mount to His younger brother Muruga. In the Dwapara Yuga, he was called Gajanana, one with an elephant head. He had four arms, white in complexion, and mounted a mouse. Dhumraketu was a demon who was Grey in color and has a smoky appearance. In spite of being a demon, he was a great scholar and had the knowledge of all subjects. This made Dhumraketu too proud and egoistic that he started killings innocents who he found were not a match for him. Hence Ganesha incarnated as the son of Shiva and Parvati for the purpose of killing the demon. When Ketu was given a planetary Status by Lord Vishnu, Ganesha became the OverLord of Ketu. In the fourth and final Kali Yuga, He incarnates as a Human faced Deity, and is referred by the name Naramuga Vinayaka meaning Human faced Vinayaka. It is said that He takes this incarnation to relate more closely with the humans, since their connectivity with the Divine is the least during this time fame. According to Sri Chandrasekara Saraswathy Swamigal – the former Sankaracharya of Kanchi mutt, Ganesha reinvents Himself and incarnates in every Yuga according to the thought patterns of the Humans that prevail during that specific epoch. Swamigal declared that in this kali yuga, it is the Naramuga Ganesha that is going to be powerful, because He is the Ganesha for this age. Dr. Pillai, the renowned spiritual scientist has remarked “We sacrificed 2 truckloads of coconut to Naramuga Ganesha who is in the small shrine of the Temple in Thilatharpanapuri in TN, India. AstroVed employed about 20 people to break the coconut. As a result, the temple that was in a small shrine of 6 ft by 6ft space and was unnoticed so far, became so popular that, now a big temple is being constructed. It is all because of the worship we do. Ganesha has become more powerful and a big temple is been constructed. Therefore with the rituals you empower the God and as the God gets empowered He empowers you”. The Power of Ganesha is the primordial energy of whole cosmos and it gets multiplied on Ganesha Chaturthi. Lord Ganesha lifts our consciousness to the next chakra, uniting us with our inner guru, thus reaching the third eye where the root source as Ganapathy that is symbolized by the Root Chakra, the Muladhara. Worship Lord Ganesha to gain His blessings this Vinayaka Chaturthi!